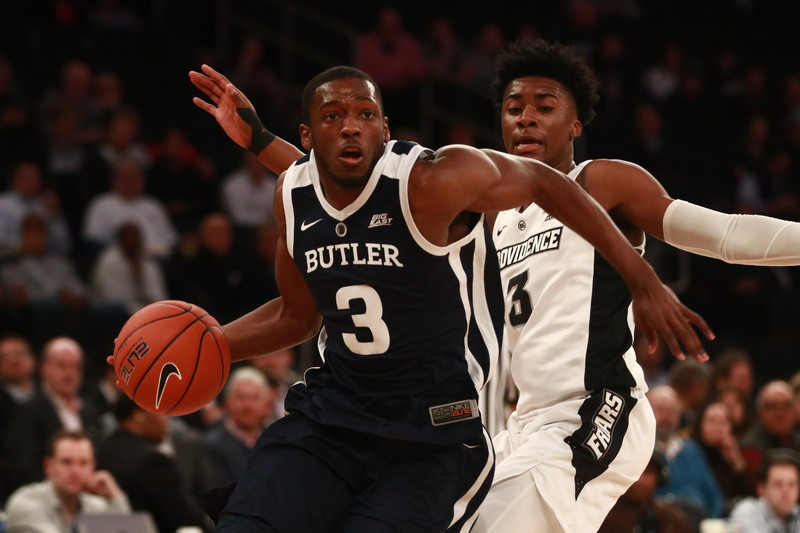 Kamar Baldwin drives to the basketball during the Butler men’s basketball team’s loss to Providence in the first round of the Big East Tournament on March 13. The Bulldogs play at Nebraska on March 20 in the first round of the NIT. Jimmy Lafakis/Collegian file photo. After beginning competition on Sunday, the Butler men’s and women’s golf teams will continue play in the Bobby Nichols Invitational, hosted by Tennessee Tech, through Tuesday. Sophomore Michael Cascino led the men’s team to second and third-place finishes at the Benbow Invitational and Savannah State Spring Fling this past week with second and third place finishes himself. The women’s team won at Savannah State and came in fifth at the Benbow Invitational. After a busy stretch, both teams will have at least 12 days off before their next competition. The men’s and women’s golf teams will wrap up play at the Bobby Nichols Invitational on Tuesday. Coming off a 2-1 series win against Western Michigan to open its home slate, the Butler baseball team will remain in town to take on Eastern Illinois on Tuesday. It’s the first of two games between the two teams this season, as the Panthers will travel to Indianapolis for a single game on May 14. Eastern Illinois enters the game with a 7-11 record following a 1-2 series at Murray State this past weekend. First pitch at Bulldog Park is scheduled for 4 p.m. and the game will be broadcast on the Butler Athletics Facebook page. The baseball team will have a quick turnaround from its game at Eastern Illinois as it plays on Wednesday against Eastern Michigan. Last year, the Bulldogs defeated the Eagles 11-6 in Michigan. Eastern Michigan is just 3-16 on the season and was swept by TCU over this past weekend. First pitch is slated for 4 p.m. and the game will be broadcast on the Butler Athletics Facebook page. Following a rough 1-4 weekend at the USF Series in Tampa, Florida, the Butler softball team will travel to Oxford, Ohio, to take on Miami (Ohio). The Bulldogs last played the RedHawks in 2017, winning 13-12. Miami will enter the game with a 12-10 record on the season. First pitch for this one is scheduled for 5 p.m. Despite not making the NCAA Tournament for the first time since 2014, the Butler men’s basketball team will continue its season in the National Invitational Tournament. The Bulldogs were selected as a five seed in the tournament and will travel to Nebraska to take on the Cornhuskers on Wednesday in the first round. Nebraska finished the regular season with a 16-15 record, including a 6-14 mark in the Big Ten. If the Bulldogs win, they’ll face the winner of the game between TCU and Sam Houston State. This game is slated to begin at 9 p.m. and will air on ESPN2. The Butler women’s tennis team will compete in its first Big East match since late January when it travels to New York to take on St. John’s on Thursday. The Bulldogs enter the week with a 10-8 record following a 7-0 victory over Hanover College. The Red Storm enter with an 8-3 record following a 4-3 win over Georgetown on March 15. First serve from the USTA National Tennis Center is slated for 12 p.m.
After opening up their outdoor schedule at the Stan Lyons Invitational in Indianapolis this past weekend, the Butler men’s and women’s track teams will travel to Nashville, Tennessee, to compete in the Black and Gold Invitational. The event is hosted by Vanderbilt University, and takes place on Friday and Saturday. After this competition, the two teams will have roughly a week off before traveling to California to compete in the Stanford Invitational. The women’s tennis team will continue its East Coast road trip with contests against Queens College and Seton Hall on Friday. The Queens College Knights have lost three straight matches, but are still an impressive 10-3 on the season. The Pirates are 8-5 on the season following a 4-3 loss against Xavier on March 15. Play at Queens College will begin at 12 p.m. while play at Seton Hall is scheduled to start at 5 p.m. The Butler men’s tennis team will host IUPUI on Friday in its third straight contest at the Butler Bubble. The Bulldogs are coming off four consecutive 7-0 wins over Cardinal Stritch, Austin Peay, Wright State and Grand Valley State, and are now on a nine-game winning streak dating back to early February. The Jaguars, meanwhile, have won four in a row and enter the week with a 10-4 overall mark. First serve on Butler’s campus is scheduled for 1 p.m. The baseball team will travel north to take on Valparaiso in a three-game weekend series beginning on Friday. Last season, the two teams played just one of their three scheduled games at Bulldog Park due to late-March snow. The Crusaders took the first and only game, 9-2. Valparaiso has lost six of its last eight contests and enters the week with a 4-12 record. First pitch at Emory G. Bauer Field is scheduled for 4 p.m. The men’s and women’s track teams will wrap up competition at the Black and Gold Invitational on Saturday. The softball team will begin both its home and conference schedule when it welcomes DePaul to town for a three-game weekend series, beginning with a Saturday doubleheader. Last year, the Bulldogs lost all three games they played against the Blue Demons by a combined score of 19-7. After compiling a 15-3 Big East record last season, DePaul is off to a 19-8 start to this year’s campaign. First pitch at the Butler softball field for the first game is 12 p.m., with the second game following after. The games will be broadcast on the Butler Athletics Facebook page. The baseball team will continue its three-game weekend series against Valparaiso with a 2 p.m. game on Saturday. After its Saturday contest against IUPUI, the Butler men’s tennis team will travel to Valparaiso, Indiana, to take on the Crusaders. Valparaiso enters the week with a 10-3 record, having won eight of its last 10 games. First serve is slated for 2 p.m. The softball team will wrap up its three-game home series against DePaul with a 12 p.m. contest airing on the Big East Digital Network. The baseball team will wrap up its three-game weekend series against Valparaiso with a 2 p.m. game on Sunday. After over a week off, the Butler lacrosse team returns to action on Sunday with a road contest against Vanderbilt. The Bulldogs are coming off a 13-2 loss at Furman on March 15, but in their previous game defeated Wofford 17-10 on the road. Vanderbilt enters the week with a 7-1 record following a 17-3 win over Winthrop on March 16. Play will get underway in Nashville, Tennessee, at 2 p.m.